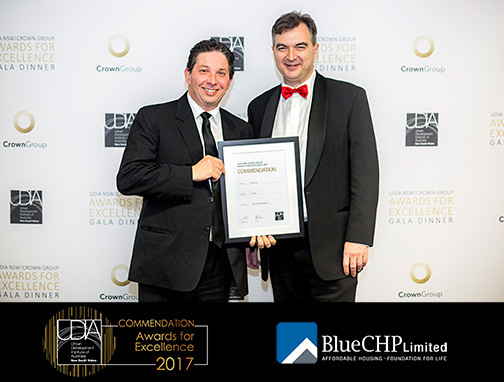 BlueCHP is proud to have received a commendation at the UDIA awards last week for its Macarthur Gardens development. The award was received in the Excellence in Affordable Development category and BlueCHP would like to take the opportunity to congratulate all the other finalists in this category. Affordable housing is of critical importance, given more than half a million Australians are living in housing stress. The supply of affordable housing must keep pace to help those in need. The Macarthur Gardens project is an excellent example of how we can deliver more affordable housing to help key workers, like nurses, police officers and teachers. The development consists of 101 units, half of which are made available at below market rates and is being built in close proximity to shopping, health and education facilities. Macarthur Gardens is was built with Cross Laminated Timber, the first time this sustainable product has been used for medium density residential development in NSW. BlueCHP is proud to have pioneered the use of this CLT, and congratulates its construction partners, particularly Strongbuild for their commitment to the product and project. Marcelo Steimbeisser, BlueCHP Head of Property Services accepts the award with Charles Northcote, BlueCHP CEO.